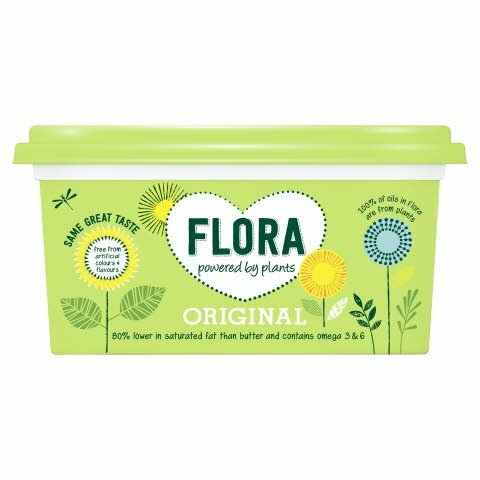 FLORA Original has been loved by your guests for generations. Our original spread recipe is made with 26% sunflower oil and contains only 45% vegetable fat. The right choice if you want a delicious spread in your professional kitchen. Water, vegetable oils in varying proportions (45%) (sunflower, linseed, palm, rapeseed), BUTTERMILK, salt (1.4%), emulsifiers (mono- and diglycerides of fatty acids, sunflower lecithin), natural flavouring (contains MILK), preservative (potassium sorbate), citric acid, vitamins A and D, colour (carotene). Suitable for spreading, shallow frying and light baking. Store in refrigerator. Suitable for freezing.